The last day at Integrate 2014 started off early with Microsoft IT demonstrating the benefits of their early investment in BizTalk Services to the bottom line, and then transitioned into presentations by Microsoft Integration MVPs Michael Stephenson and Kent Weare discussing the cloud in practice, and how to choose an integration platform respectively. 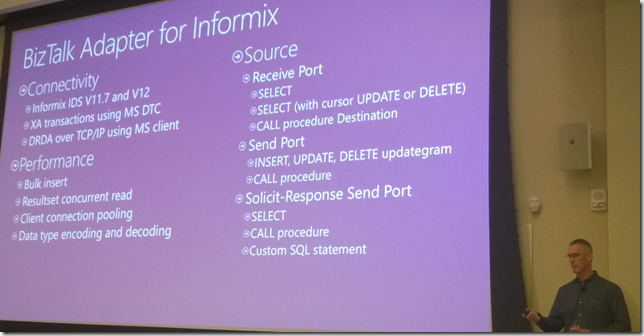 Those last two talks were especially good, and I would recommend giving them a watch once the videos are posted on the Integrate 2014 event channel on the Channel 9 site. At this point, I’m going to stray from the style of my previous posts on Integration 2014. The reason for that is that I want to take a little bit of time to clarify some things that I have posted, as well as to correct factual errors – given that we’re all learning this stuff at the same time right now. Don’t get me wrong, I do not at all want to discount the excellent sessions for the day from Integration MVPs and partners, I just believe it more important right now to make sure that I don’t leave errors on the table and propagate misunderstanding. 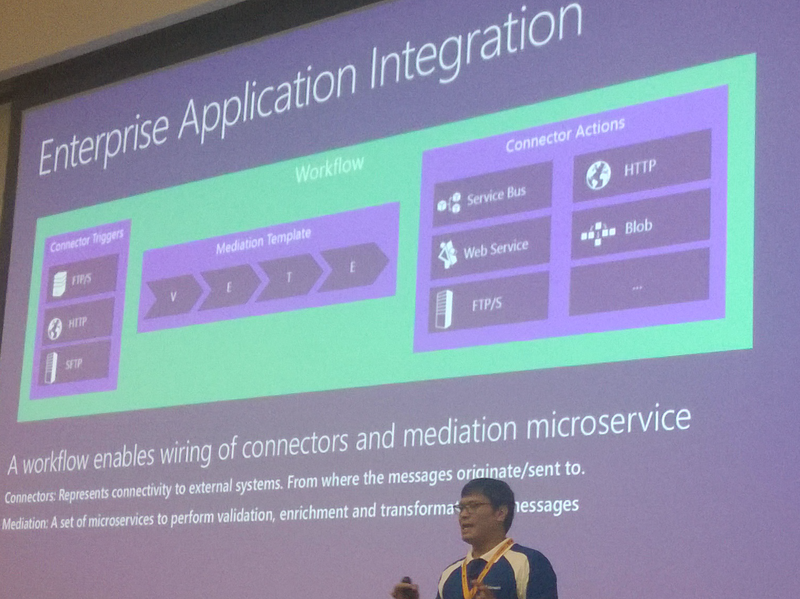 It seemed like throughout the conference, the whole BizTalk team, but Guru especially, was constantly fielding questions and correcting misunderstandings about the new microservices strategy. To that end, he organized an informal ad-hoc panel of fellow team members and Microsoft representatives to put everything out on the table and to answer any question that was kicking around in the minds of attendees about all of the new stuff for the week. I’m going to let an abbreviated transcript (the best I could manage without recording the audio) do the talking here. 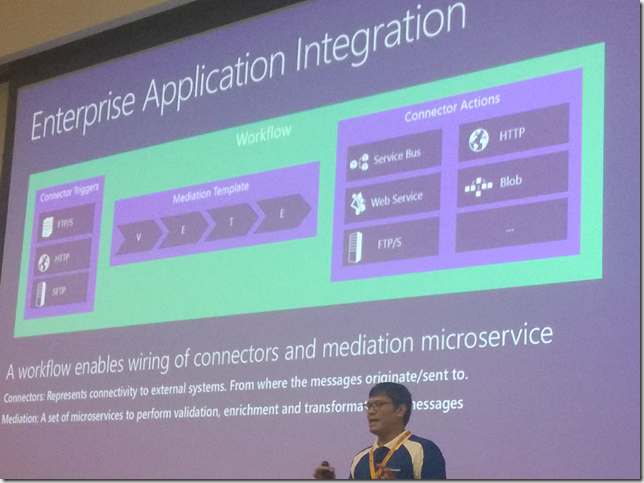 Q – We heard about microservices on Wednesday, how come you (to Kannan from MS IT) are going live with MABS, when you know that there are changes coming down the pipeline? Q – (Michael Stephenson): I’m kind of one of the people that gives Guru quite the hard time […] About this time last year, I did a really deep dive with you on MABS 1.0 because we were considering when we would use it, what it offered, what the use cases were. At the time, I decided that it wasn’t ready for us yet […]. When we did the SDR earlier this last year, it was quite different at that time […] We were giving the team a lot of feedback on isolation and ease of deployment, and personally my opinion is that I really like the stuff shown this week, you really fielded that feedback. What I’ve seen from where we were a year ago, and from that SDR, personally I’m really pleased. A) Don’t worry about coming around and telling us what we’re doing wrong — we do value that feedback. We will commit to come back to you as often as we can […]. (Vivek): Here’s how I think about the product: there’s a few fundamental things that we HAVE to get right, and then there’s a feature list. I’m not worried about the feature list right now, I’m worried about what we NEED to get right to last for the next ten years. Don’t worry about how we’ll take the feedback, send us your emails, we value that feedback. Q: I had a conversation with Guru outside, which I think is worthwhile sharing with everybody […] I was really confused at the beginning of the session as to how microservices fits in with where we are with BizTalk Server and with MABS 1.0 and where that brings us moving forward. How do the pipelines and bridges map to where we’re going. I was really excited about the workflow concept, but I couldn’t see that link between the workflow and the microservices. A – (Guru): The flow was that you had to have a receive port, and a pipeline, and you would persist it in a message box for somebody to subscribe, and that subscriber could be a workflow and a downstream system. That was server, that continues and that has been there for 10+ years. Then there’s a pattern of I’m receiving something, transforming, and sending it somewhere, and in services that was one entity — and we called that a bridge. It consisted of a receiving endpoint a sequence of activities and then routing it. This concept was a bridge. If you look at it as executing a sequence of activities, then what you have is a workflow. 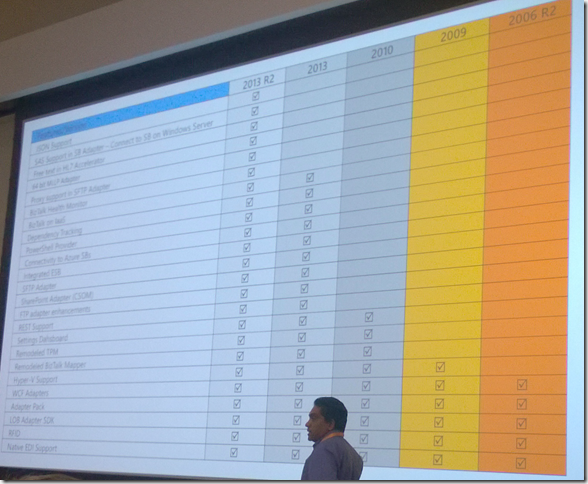 Q: We’ve got a small but critical BizTalk 2006 installation that we’re upgrading now, or in the very near future. And I was wondering if we should upgrade it to 2013 R2, or should we upgrade it to the next release, and when is the next release? Then, look at what the application is doing. Is it something that needs to be on-prem, or is it something that is adaptable to the cloud architecture, or even if that application is something that could be managed in the cloud? There’s nothing that is keeping you from migrating to 2013 R2 today. Q: How do we reassure our customers that are moving to cloud based integration now, and are seeing MABS now, and are seeing the same tweets about the next version? Migration tools aren’t the full answer because there’s still a cost in doing a migration, so how do we convince customers to use MABS now? (Vivek): Remember MS IT is one of the biggest customers, and it’s not like we’re telling them a different thing than we’re telling you […]. Joking aside, the stuff they’re running is serious stuff, and we don’t want to take a risk, and if there’s not faith in that technology, I don’t want them to take a dependency on it. Q: How will the Azure Resource manage fit into this picture? A – (Vivek): [How] Azure Resource Manager fit in? Azure Resource Manager is a product that has a purpose of installing resources on Azure. It is built on an engine that can execute actions in a long-running fashion, and wait for the results to come, it does parallels. 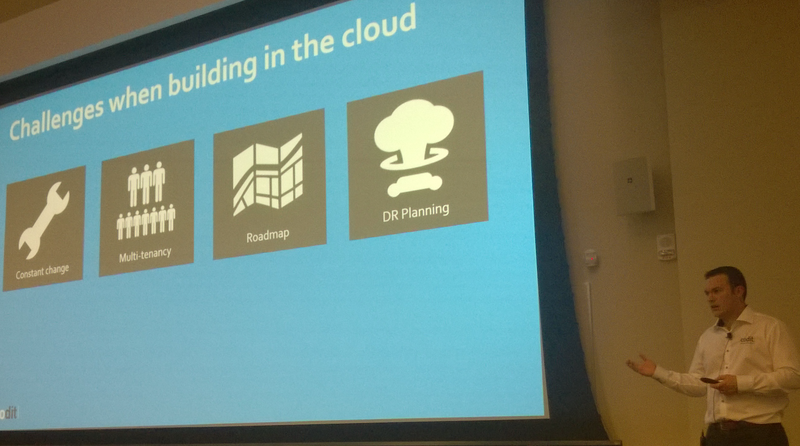 Azure Resource Manager has a purpose and it will be its own thing, but we’re using the engine. We picked that engine because it’s already running at a massive scale and it was built thinking about how the workload will evolve eventually. It already knows how to talk to different services. We share technologies, but those are two different products. Q: What is the ALM story? A: Support for CI for example? The workflow is a part that we’re still trying to figure out. For the microservices technology part of it, the host that we run on already supports it. One other feedback that came was “how do I do this for an entire workflow” and we’ll go figure that out. A – (Vivek): I think there are two kinds of decisions. One are the business decisions (do we need to have it on premise, etc…) What stays on Hybrid vs what goes on cloud. We want you to make the decision based on business, we will have technology everywhere. There are patterns that you can benefit from. I think componentizing [will be good]. There are design principles that are just common patterns that you should follow (e.g., how you take dependencies). So that’s where we are in terms of hearing things direct from the source at this point. Certainly a lot of information to take in, but I’m really happy to see that the team building the product realizes that, and is actively working on clearing up misconceptions and clarifying the vision of for the microservices ecosystem. Before I wrap this up, I want to give 3 shout outs right now in terms of the content that I more or less glossed over and/or omitted right now. Stott Creations is doing great things, and I have to hand it to the HIS team for being so intimately involved in not only helping a customer, but helping a partner look good while helping that customer. 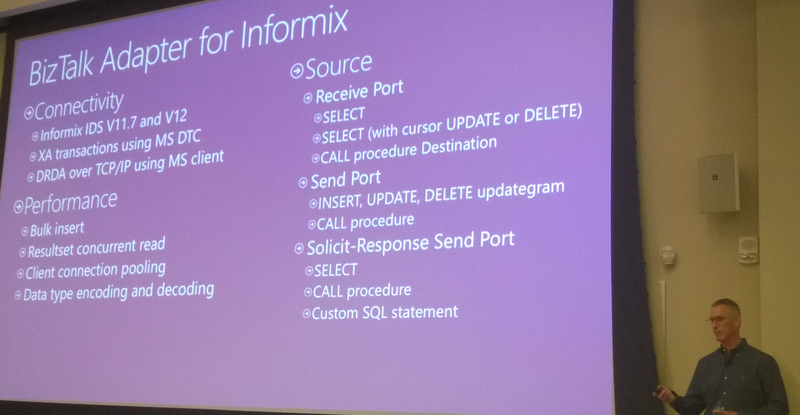 In addition to that – the Informix adapter looks awesome, and I’m really digging the schema generation from the custom SQL query; that was a really nice touch. Last, but certainly not least, I want to give a shout out and huge thanks to Saravana and the BizTalk 360 team for making the event happen. Also they really took one for the team here today as well, as Richard Broida pointed out – ensuring that everyone would have time to share on a jam packed day. The execution was spot-on for a really first class event. As a final thought from the Integrate 2014 event: We’re constantly seeing Microsoft bang the drum of “Azure, azure, azure, cloud, cloud, cloud…” Personally, I love it, I fell in love with Azure in October of 2008 when Steve Marx showed up on stage at PDC and laid it all out. However, what we can’t forget, and what Microsoft needs to remember is that any customer bringing their applications to the cloud is doing integration – and Microsoft’s flagship product for doing that integration, better than any other, is BizTalk Server. BizTalk Server is how you get customers connected to the cloud – not in a wonky disruptive way – but in a way that doesn’t necessarily require that other systems bend to either how the cloud works, or how BizTalk works. These are good times to be a developer, and great times to be connected into the BizTalk Community as a whole. The next year is going to open up a lot of interesting opportunities, as well as empower customers to take control of their data (wherever it lives) and make it work for them. I’m out for now. If you were at the conference, and you want to stick around town a little bit longer, I will be teaching the BizTalk Server Developer Deep Dive class over at QuickLearn Training headquarters in Kirkland, WA this coming week. I’d love to continue the discussion there. That being said, you can always connect live to our classes from anywhere in the world as well!